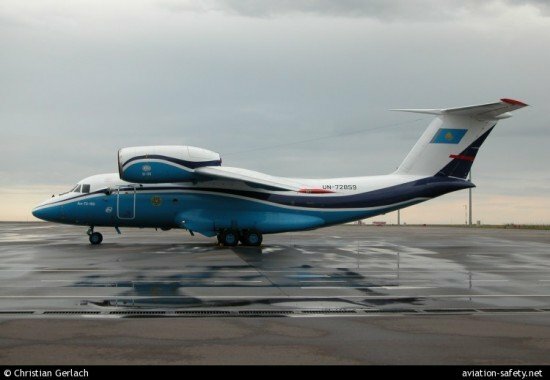 Altimeter problems caused a controlled flight into terrain (CFIT) accident involving an Antonov 72 in Kazakhstan last year, according to the preliminary findings reported by the Prosecutor General’s office of Republic of Kazakhstan. On December 25, 2012 an Antonov 72 transport plane, operated by the Kazakhstan Border Guards, crashed some 20 km from Shymkent Airport (CIT), Kazakhstan. All 20 passengers and seven crew members were killed. Among those killed was acting director of National Security Committee’s Border Guard Service, Colonel Turganbek Stambekov. The airplane took off from Astana Airport (TSE) at 16:52 with destination Shymkent Airport (CIT). Shortly after takeoff the autopilot failed. The captain then decided to fly the plane manually. Two minutes and 40 seconds after takeoff the radio altimeter also failed. The flight was continued using barometric altimeters. Nineteen minutes into the flight there was a momentary failure of these altimeters as well, with the altitude dropping from 696 to -1375 metres. Three minutes later the alimeter again suffered a momentary spike, this time from 749 m to 2672 m.
En route and during the descent towards Shymkent the flight encountered poor weather with heavy snowfall and limited visibility. During the approach to Shymkent, the captain failed to set the correct pressure for the barometric altimeters. The altitude indicate was therefor off by about 385 metres. The airplane struck the slope of a ravine 21 km short of the runway and broke up.